In this post I will tell you about the nice trip we did on our second day in Sapporo which we made together with some of my Oakhouse roommates. Whenever you make it to the northern island of Japan it is definitely worth to go exploring a little bit. Sapporo itself is just a regular Japanese city but Hokkaido itself and the nature there is absolutely fascinating. Of course you might also go snowboarding here as the best Japanese ski resorts are located here, but this time we decided to not go snowboarding and rent a car instead and explore Otaru and the region between Sapporo and Otaru. 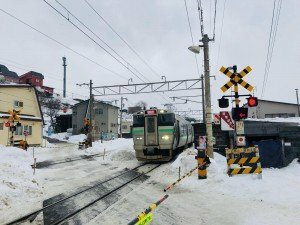 It is also possible to explore Hokkaido by train, but my friend and me were not eligible for the JR Rails pass so we were cheaper of renting a car. Otherwise the train is definitely recommended to go to Otaru and most people are using this mode of transport. Otaru itself is a former fisherman’s village located about half and hour north of Sapporo. Part of the Japanese navi is stationed here and there are also Venice-like canals through the city which are beautiful to watch in winter. The city is famous for its seafood, so you should definitely check out one of the local restaurants. There are plenty of them located right in the centre of the village. The old harbor area is a great place to visit as well. Not many tourists are there but it is a perfect photo spot with old industrial buildings and Japanese navy ships. After exploring Otaru and before you head home to Sapporo you should definitely make a stop at the nearby Asari train station. It is a super small train station located right by the ocean which makes it a scenic photo spot. Be aware that the place might be super crowded by Chinese tourists and all of them are trying to get the perfect picture with the train. Even if you don’t want to take a picture there it is fun just to watch the people there. After exploring Otaru and Asari we drove straight back to the airport and returned the car at the car rental station. Everything was perfectly organized and we were even allowed to use the shuttle bus to the airport for free. That weekend was definitely one of my favourite weekends in Japan. Once you should definitely visit Hokkaido, no matter if just for sightseeing in spring or snowboarding and winter wonderland from November to February.